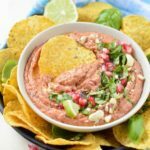 Friday is here, party food time and I have got the most delicious bean dip recipe to share with you. Did anyone else love party food during the week end? I mean, isn’t that fun to eat with your fingers with no table rules. Mum is a typical French lady, dressing a table for every single meal. Back then, I always find dinner time a bit boring as a kid. I mean, don’t misread me, I loved mum food. But, sitting at the table with starter, meal and dessert everyday sounds a bit too much for kid. Lets face it a typical French family loves spending hours at the table eating and talking. Maybe it is the reason why I love breaking the week routine with my kids and to makes finger food nights on weekends. Friday is particularly special to us. Emma goes to her swim lesson with dad and they are not home before 7 pm. It give me plenty of time to prepare tons of lovely fun dishes to share when they are back. [Brackets] this is also the time where I can enjoy a warm bubble bath and glass of red wine. Finger food night in my house is really something cool . We sit on the floor around the coffee table, shut down the ceiling light, light a soft table light and lots of perfume candles plus, French music in the background. Here you are in my house on a Friday night. Add as it is winter we often light the fireplace as well which brings the most beautiful light in the house. Don’t you think that the lighting in your home affects how you feel ? I mean, this really cool down the place. Each time we do Fridays finger food night Emma is so calm! Lights really soften the mood of the house. 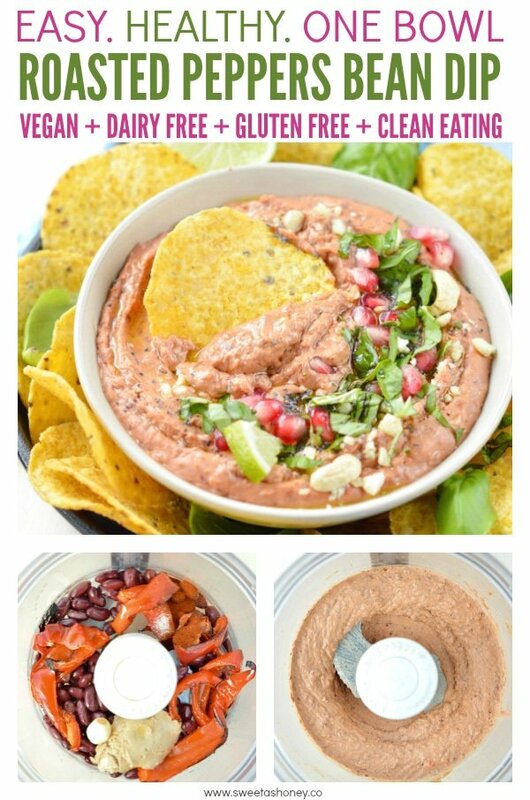 So back to my healthy roasted red pepper bean dip recipe now. 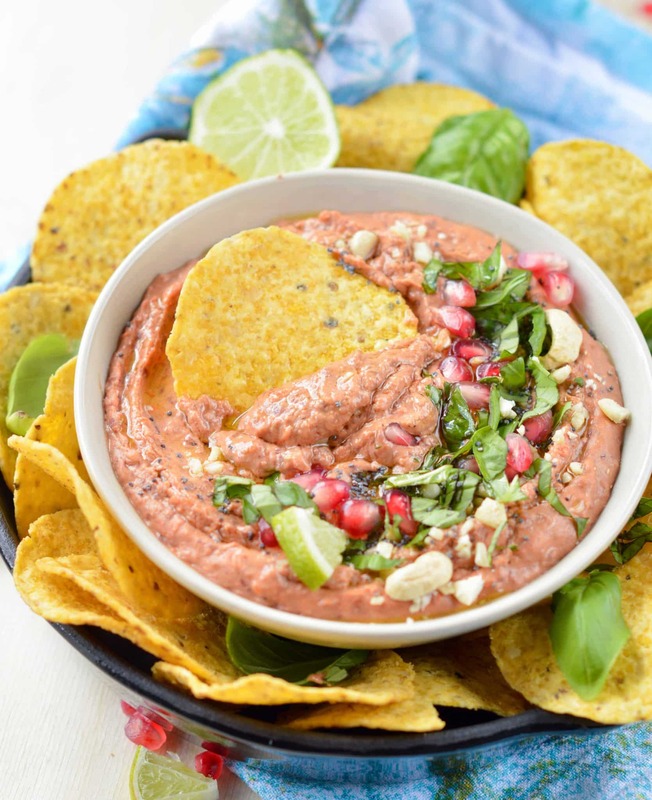 I made this Roasted Red Pepper Bean Dip Recipe as an Healthy Dip alternative to my regular hummus recipe. I love it because it is ready in 10 minutes, packed with protein from red kidney bean and nut butter. Plus, it is vegan – goes well with our new food resolution ! – and super tasty to dip Mexican corn chips, raw veggie or simply spread into sandwiches. 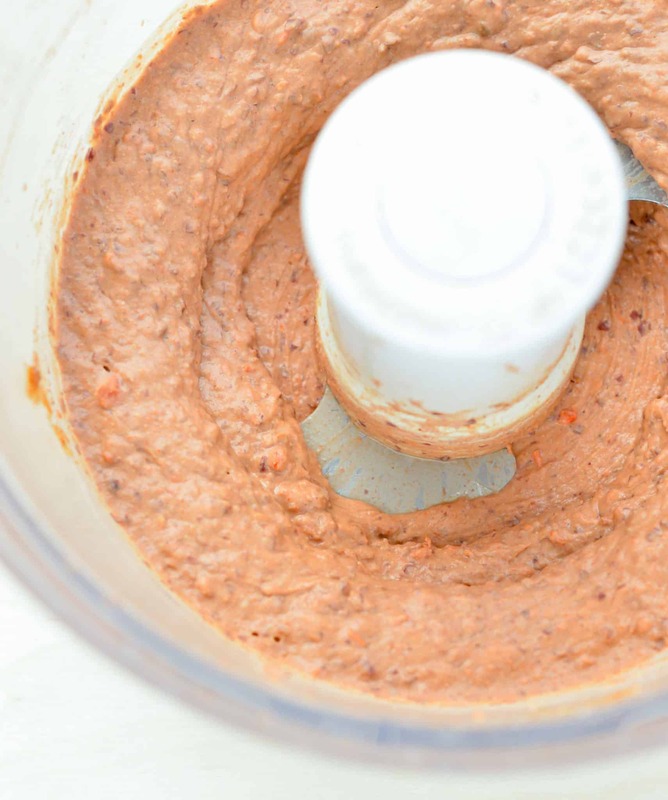 This is a really versatile bean dip recipe that you can make with different nut butter to change the flavor each time. My favorite is cashew butter and peanut butter. So enough small talk. Lets jump to the recipe ! Happy Friday. 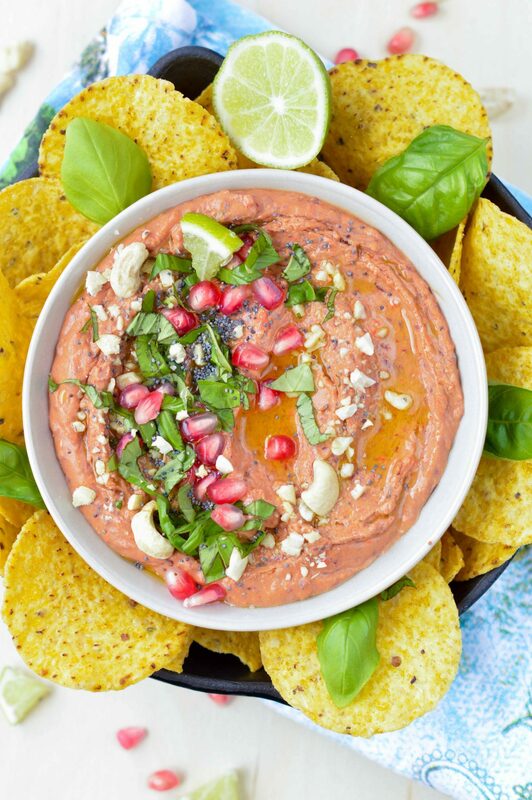 This Easy Roasted Red Pepper Bean Dip Recipe is an Healthy Dip alternative to hummus recipes. Ready in 10 minutes, packed with protein from red kidney beans and nut butter. A great vegan appetizer to dip mexican corn chips or a lovely vegan spread for sandwiches. Core and seed peppers then slice into thin strips. 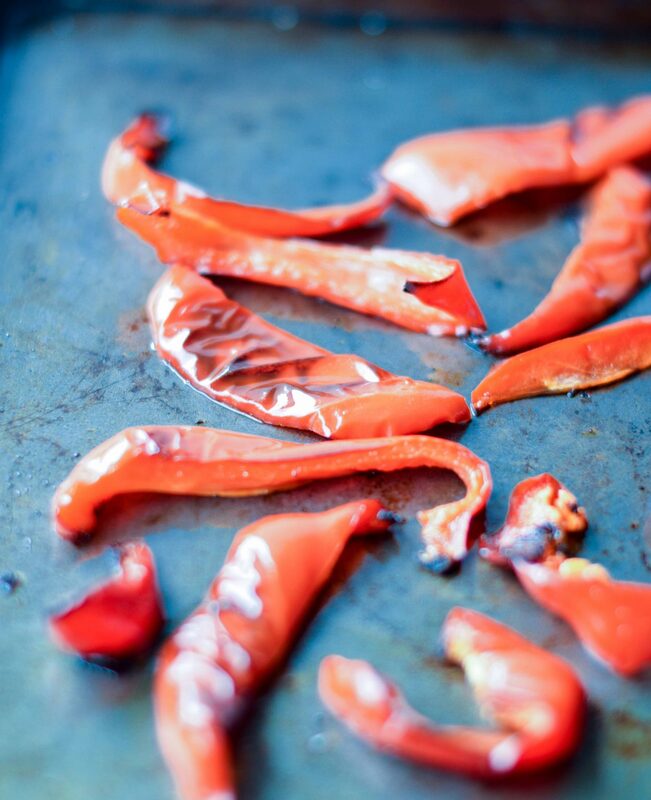 Place the peppers strip onto a cookie sheet, drizzle 1 tablespoon olive oil and bake for 15-20 minutes, stirring every so often to roast each sides. Remove from the oven. Set aside until lukewarm. In a food processor, with the S blade attachment, add all the ingredients. Blend until creamy and smooth - about 1 minute. Store in the fridge up to 4 days in a airtight container. Nutrition panel per serving. This bean dip recipe serve 10 portions. This looks Delish! How much is a serving? 1/2 cup? 1/4 cup? Thank you! You’re welcome ! 🙂 no problem. Enjoy the recipe. xoxo Carine. Would there be a way to make this keto? What could I sub for the beans? Thank you ! 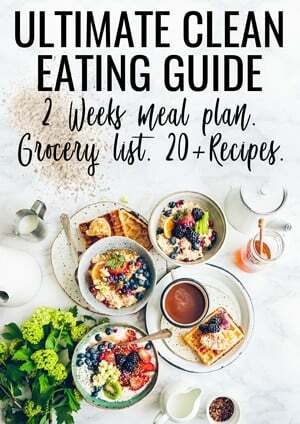 I have got lots of low carb recipes on the blog, not all keto friendly like this one. I would recommend using steamed cauliflower instead of black bean, would be delicious or try my cauliflower dip recipe HERE instead! It is 100% keto friendly. Enjoy the recipes on the blog. XOXO Carine.